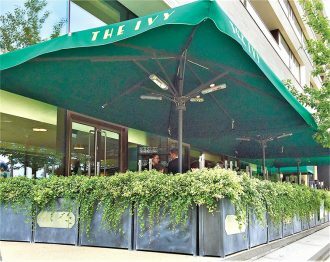 The Ivy Brasserie, currently sweeping the land as its iconic, in-crowd honeypots pop up in hot property spots, is synonymous with classic British/European all-day dining, sophisticated and super stylish as well as being magically relaxed and welcoming. Just the place for a special catch-up over morning coffee, a celebratory lunch/dinner or a spontaneous glass of bubbly for care-free passers-by. One such freshly opened honeypot is The Ivy Brasserie, Tower Bridge, having only recently smoothly swung open its doors to unrivalled views of one of London’s most iconic landmarks. With artfully designed, brightly patterned, tactile interiors, laced with soft velvet seating, the restaurant’s upstairs private room with a view and downstairs dining and bar areas are all fronted by a terrific open terrace. The Ivy Brasserie Tower Bridge’s terrace is on the flat, with the seating area cleverly formed and screened by Garden Requisites’ very own steel café planters, planted with mature low hedging and under planted with, of course, Ivy. Instant wow factor for brasserie designers and builders, the zinc-galvanised, tall steel troughs are incredibly robust and long lasting and when on castors, for swift set-up and closing move-arounds, are so much more durable than cheaper fibreclay alternatives. 20 metal planters surround the al fresco seating with two larger planters positioned either side of the terrace. The Ivy’s Design & Build team were so pleased with the planters for the Tower Bridge restaurant that they went straight on to wisely invest in some more in an aged zinc-galvanised finish for the Ivy Brasseries in Soho, London and Edinburgh. Mother company Caprice Holdings also arranged for them to be painted in Azure Blue for the Granary Square Brasserie in Kings Cross, London. John and the workshop team, as we write, are busily crafting more planters on order for new Ivy Brasseries in Guildford and Brighton. See if you can spot them when you’re out and about and worry not. For close-up admiration in the cooler months, blankets are provided. Because our thick steel designer planters and troughs are handcrafted by John & team in our workshop near Bath, they can come in a variety of sizes and even in bespoke dimensions to fit into and around awkward spaces or to align with a certain height of café/restaurant seating. Unlike so many other stockists, because we are designer/makers, we can also fashion circular and triangular planters, with added extras available across the shapes such as clear, sheltering glass screens or trellis panels for privacy, planted with deliciously scented and/or evergreen climbers. Our screening planters aren’t only for brasseries, bistros, cafés and hotels of course. They can also be used in domestic gardens, to delineate paths, define patio and courtyard spaces or create interesting nooks in the wider garden. As ever, if there are any questions on sizes or design, please do give Hilary and team a call. In the meantime, do don some shades and join us on the terrace?